As a high school student, Carolyn R. Mirabile developed an intense interest in civics, politics, and, particularly, the U.S. Constitution. She also had a strong desire to help others and to lend a voice to those who did not have one. When it came time to determine an area of study, she chose something that would enable her to marry her two interests: the law. Mirabile attended Villanova University School of Law and earned her Juris Doctor in 1991—the same year she was admitted to legal practice. Early on, she found herself drawn to family law cases, in part because “nobody else wanted to do family law,” she says. She has since become a partner with Weber Gallagher Simpson Stapleton Fires & Newby LLP, as a key member of the firm’s Family Law Group, which is based in Norristown. Mirabile concentrates her practice in all areas of complex and high-net-worth divorce, support, and custody cases, as well as property distribution and the drafting of marital settlement agreements and prenuptial agreements. In addition, she is a skilled mediator, with experience as a court-appointed custody mediator and a presenter of several mediation-training programs. Mirabile works closely with her colleagues in Weber Gallagher’s Family Law Group, including fellow attorneys John Zurzola and Donna Marcus. Mirabile and her two colleagues are still mourning the loss of Lynne Z. Gold-Bikin, who had been chair of the Family Law Group until October, when she passed away unexpectedly. Mirabile has received an AV Preeminent Rating Martindale-Hubbell, while several respected publications—including Suburban Life—have bestowed her with “Top Attorney” honors. Specifically, Super Lawyers has named her a top-rated family law attorney every year from 2011 to 2018, based on peer recognition and professional achievement in legal practice. In addition to her work with Weber Gallagher’s Family Law Group, Mirabile has long been devoted to helping her fellow attorneys and the individuals they represent. In 2016, she became President of the Montgomery Bar Association (MBA), the state’s third-largest Bar behind its contemporaries in Philadelphia and Allegheny County. She was the fourth female president in the Bar’s more than 130-year history and the first family law attorney to hold the association’s top office in more than a decade. Although her tenure as President has since concluded, Mirabile remains heavily involved in the MBA, including serving as co-chair of the association’s Diversity Committee. The Committee’s initiatives include the Robert E. Slota, Jr. Summer 1L Diversity Program, which for more than 10 years has been matching students of diverse backgrounds with opportunities to work with and learn from attorneys in Montgomery County. Likewise, Mirabile chairs the Diversity Committee for Weber Gallagher. Composed of members who represent differences in ethnicity, race, gender, sexual orientation, backgrounds, and viewpoints, the firm’s Diversity Committee focuses its efforts in areas such as hiring and recruiting, retention and promotion, marketing and community outreach, and diversity awareness and training. 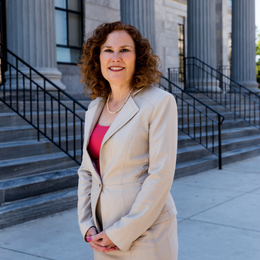 Throughout her career, Mirabile has enjoyed the many leadership roles she has filled, including serving as a member of the Pennsylvania Bar Association’s House of Delegates. She remains committed to guiding the next generation of family law attorneys, both within her firm and beyond the walls of its offices. “The members of my generation need to make sure they are mentoring the younger generation to respect the Court, their peers, and their clients,” she adds. “I’ve always tried to help students who aspire to work in this field, whether it’s helping them to improve their résumé, working with them to do mock interviews, or getting them to think about the next phase of their education or career. It’s very rewarding.